MSI haven’t installed the word ‘slim’ into their range of laptops for nothing, you know. The X340 and X600 are both sporting Intel Ultra Low voltage processors to boost power and of course nab you some green points with the environment. 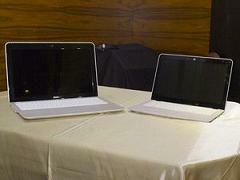 And according to their creators, both lappys are “another new mark in history of the notebook market”. The X340 has a lot in common with its super thin predecessor, the X320. So as well as a 13-inch LED display and 1.4kg body mass, it also packs a 16:9 screen resolution and it measures at 1.98cm thin at its thickest point, making it thinner than my current reading material. However, in contrast to the X320’s mobile computing loyalties, the X340 has been designed with multi-media users in mind. This is why it comes bundled with an Intel Centrino processor with ULV technology, for a more efficient performance, multimedia features and power saving prowess. MSI tells us its power is so damn good in fact, its total power consumption is just one sixth of other notebook’s power eating capabilities. As a multimedia laptop, the X340 comes complete with multimedia features such as full I/O ports, HDMI port, Blu-Ray support, WiFi, Bluetooth and there’s even WiMAX units available too. When a celebrity has a high number of column inches, they’re deemed more popular than the rest. So working on that same premise, but swapping column inches for paragraphs, it would appear MSI doesn’t think its X600 model is important as multimedia toting pal. The information I managed to squeeze from the paltry one paragraph given to explain its capabilities, is that it’s an ultra portable 16:9 widescreen 15-inch notebook, weighing only 2kg (so maybe that’s what MSI were going on about when they said “this is another new mark in history of the notebook market”?). MSI are keeping schtum on pricing and availability details, but expect more information soon.